NORTH NASHVILLE, TN — Childhood friends and proud Tennessee State University alums; Clinton Gray, III, Derrick “Mo” Moore and Emmanuel “EJ” Reed, are no strangers to entrepreneurship. The trailblazing trio are owners of GT Services, which operated Green Truck Moving, and are proprietors of the much-touted Slim & Husky’s Pizza Beeria. Slim & Husky’s, located in North Nashville at 911 Buchanan Street, has become extremely popular to not only the North Nashville corridor residents and area employees but also has garnered a large following throughout Davidson and surrounding counties. With the explosion of endless positive reviews on Trip Advisor and Yelp, visitors to the Nashville Area have joined the chorus of many singing the praises of eating Slim & Husky’s delicious pizzas as they check off their bucket lists of Things to Do while visiting Music City. Since Slim & Husky’s debuted in early spring, the lines and loyal customers have grown very rapidly. To see customers in line at popular restaurants like Pancake Pantry on 21st Avenue near Vanderbilt is acceptable and makes for many ‘You are so NashvilleIf’ jokes. Many see it as a badge of honor to stand in the line for hours for breakfast. 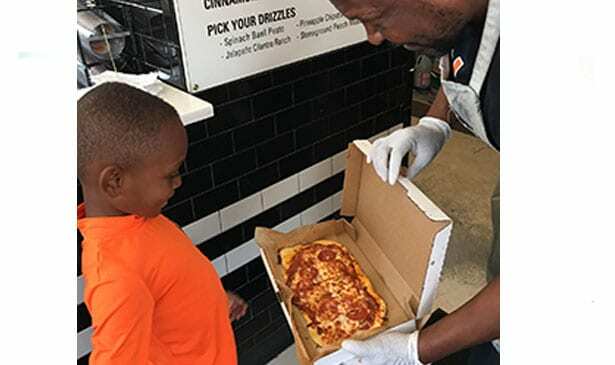 However, to see a line appearing around 10:30 am for an African-American owned establishment barely six months old near TSU makes everyone take note and super curious to bite into the custom made to order pizzas. The popularity of Slim & Husky’s, with lines, has the new restaurateurs gearing up for another grand opening in Antioch in the fall in the former Applebee’s across from Hickory Hollow Mall and a carryout location with a retail store, The Rollout. The carryout location will double as a catering kitchen and will be located on Buchanan Street across from the flagship restaurant. As if they are slaying all naysayers and putting to bed any doubt that they know what they are doing, the dynamic trio are also capitalizing on the Slim & Husky’s social media branding by opening a merchandising store in the old James Otis hat store. The Rollout will give customers a “taste” of Slim & Husky’s to wear. If you are keeping count of the number of real estate transactions, that is three commercial buildings to date. “As natives of Nashville, we are aware of the developments that have contributed to the new ‘It City’ persona. In the midst of our excitement for Nashville’s growth, our team is still focused on providing creative local concepts to communities that have been overlooked. North Nashville and Antioch are great examples of these,” stated Gray. “We could have opened our restaurants in any ​area​ in the city but we were intentional about being in the locations that we selected. We want to be great entrepreneurs. But we ​are ​also focused on economic development. We wanted to bring jobs to North Nashville and we wanted to be investors in the communities where we were raised and educated. We are very proud of being able to show that opening a business can happen​ ​in North Nashville​. Our success will attract others to follow our lead,” said Moore. When asked if they were jittery about opening a restaurant? The answer was an immediate collective, “No, Ma’am!” “This is not our first rodeo at owning a company,” stated Reed. “We have been entrepreneurs and a team since 2010. We learned how to research the market. We spent two years traveling the country learning from others who have been and who are still in the restaurant business. We had a passion and drive to open Slim & Husky’s and we love what we are doing.” Their passion for business and their community shows. ​Sim and Husky’s is open from Mon-Sat. from 10:30am-11:00pm and closed on Sundays. The phone number is 615-647-7017. The website is www.slimandhuskys.com.